Daktyla meaning ladies’ fingers, is a very old recipe with a few ingredients but so delicious. As most of the Cypriot traditional recipes, these were made with simple everyday ingredients which they usually had at home. 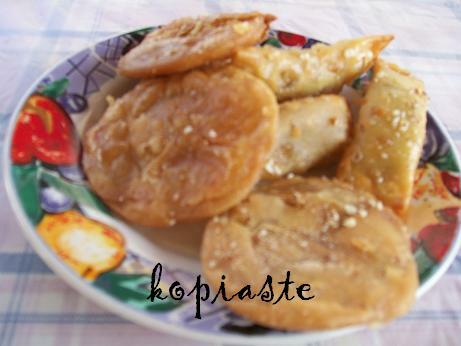 This is one of the many Cypriot specialties offered during the pre-lenten period called “Sikoses” in Cyprus. The word “sikoses” derives from the verb σηκώνω = sikono, meaning lifting. Sikoses is the ten day period before lent when the lifting of all the meat takes place before Easter. 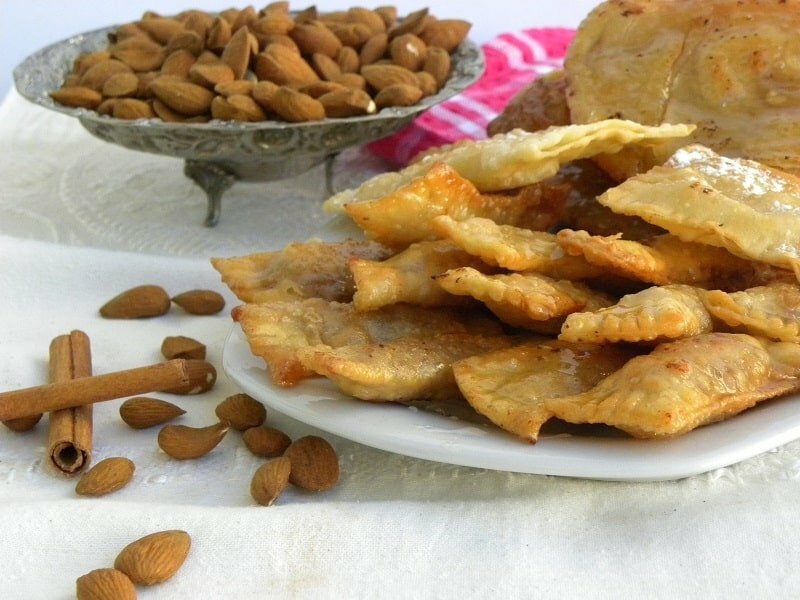 As most of the Cypriot traditional recipes, these were made with simple ingredients which were always available in any household. A very old recipe with few ingredients but so delicious. Making daktyla used to be quite a difficult job, having to roll out the dough into very thin phyllo by hand but nowadays it is much easier using a pasta machine, although the procedure is time consuming as it takes some time to make them. I remember my mother would make them quite often and she used to roll out the phyllo the traditional way, by hand. She always needed some help and she would call me to help, as by the time I was 10 -12 years old shes was about 55 years old and suffered from rheumatism. The remaining five siblings were either married or lived abroad. The youngest of them all was my brother and he was seven years older than I and my first sister was seventeen years older than me, so I was the only one left to help her. At the beginning she would tell me to press the edges with a fork and gradually year by year I helped her even more and would even roll out the phyllo, until I got married and then bought a pasta machine, which made things much easier. Instead of making the syrup from scratch, I sometimes love using my leftover syrups when making “glyka tou koutaliou” (Greek fruit preserves). You should try them especially with bergamot syrup, as the taste is amazing! Prepare the dough and set aside to rest. Put the sugar, honey, water, cinnamon stick, cloves and lemon peel in a pot and bring to a boil. Lower heat and simmer for 5 minutes. Remove cinnamon, cloves and lemon peel and add the lemon juice and blossom water and let it cool. Finely pound the almonds but do not powder and mix with sugar, cinnamon, and as much of blossom water to make them hold together. Roll out the dough to make a very thin phyllo. Make a long piece of phyllo with width not more than 6 cm (2½”). Place about 1 tsp of filling at the edge and roll twice to the shape of a finger. Cut with a knife and press the edges firmly with a fork to seal. You can also make one large phyllo and add the filling alongside leaving gaps between each other about 4 cm (1½”). The remaining procedure is the same: roll it twice, cut it lengthwise, separate among the gaps, cut and then press with a fork. Place them on a floured surface not too close to each other because they may stick together. Cover first layer with cling film and add another layer on top. Heat plenty of olive oil in a frying pan and fry on both sides, until golden. Remove in the syrup until the other batch is fried. Remove to a colander for a few seconds and then place on a platter. Note: Although it is a very simple dessert, it is best to have help during the frying procedure as they fry very quickly. They have to be placed in the syrup immediately and removed quickly to a strainer as the next batch will be already frying in the pan. The Almond stuffed pastries called Daktyla are my entry for Let’s go Nuts with Almonds, hosted by JZ, of Tasty Treats. I am also sending this recipe to In My Box, hosting this month’s Sugar High Fridays #53, created by Jennifer of The Domestic Goddess. Dear Ivy how beautiful are your stories ! I’d love to make these sweets with you sometime!!! Wow Daktyla looks yum…..The process may be long but the end results make me drool…….Thank you for such a beautiful and adorable award. I’m trying to remember if I’ve ever had these…they look familiar. (Are they similar to “poura” (cigars)?) Anyway…delicious looking Ivy! Mmm, syrup with orange and spices sounds divine! These Ladie’s fingers look so good! An exquisite treat! These sound delish Ivy – almonds and orange blossom water make for an interesting combination. Love your photo montage. Thanks for the award! I am very honoured. Thank you so much for sending this to Lets go nut – Almonds!! Ivy, good post…a reminder for me to try these…I have them bookmarked to try out in a cookbook. Thankyou for passing mle the award. It is always wonderful to learn new kind of food from your place. This one looks so delicious and going throught the recipe i can say it must be really really yummy to eat these. Thanks for considering my blog “Adorable”, Ivy. First of all congratulations on your awards Sis, and thank you for bestowing it upon me as well. These pastries sound incredible. They are almost like filo Spring Rolls and very, very tempting.I admire you so much. I don’t think I would spend the time to prepare my own filo. We can get a thicker grade of filo that give our dishes that “almost homemade” feel, we can also get wholewheat filo as well. Efharisto, Ivy! I value this award and your friendship. I will write a blog post about this award soon when I have had time to think about who else to bestow it to. Aw, thanks Ivy! I really appreciate the award! Those Lady Fingers look awesome! I imagine they are very satisfying to crunch into. mmm… i can believe these must be a winner amongst kids. we have similar treat using spring roll wraps, though we use banana instead of nuts. i still do it for my family sometimes, though I myself cannot eat it. put some nutella in it, surely they will be finished before you know it! I love these, especially for the filling. I can’t resist anything with almonds. They look so scrumptious! Thank-you so much for passing on your award to me. Your as sweet as these Daktyla! I know these very well, but only ever as daktyla. My father loves them and would go crazy if I made them for him!!! I’m adorable? Aw, shucks. Thanks a bunch, Ivy. The Daktyla sounds good and yummy, I don’t think anyone would feel that they are fasting for lent! Congratulations for the award! and thanks for passing on to me 🙂 You’re truly truly adorable!!! Well worth the effort I am sure! And thanks for the award Ivy. I’m flattered you thought of me. Your quite charming and adorable yourself. Those look SO yummy and I can just imagine them with that hint of bitter orange water. Yum! And thank you for the cuteness award – how fun! Dearest Ivy, You will think I’m so rude! I haven’t said anything for a while, not even thank you!!!! Sorry girl… I don’t spend as much time in front of my Pc lately plus I feel a bit lazy about blogging… Hopefully the excitement will come back soon. A recipe that’s about 2000 years old ?! Amazing ! I bought your cookbook and made them. No words to describe how delicious there were!